After cutting down two teams into one roster, Team USA faced Sweden in the first offical game of the World Junior Summer Showcase. After going down early in the game, USA came out on top in overtime thanks to efforts by Quinn and Jack Hughes. The game was overall messy and the United States looked out-of-character, something they should look to improve before their tilt against Finland. The United States’ issues all stemmed off a short list of system errors: defensive lapses, heavy reliance on the forecheck and an inactive power play. The defensive lapses were prevalent on three of Sweden’s four goals. In two circumstances, the United States was careless. They either got caught up ice or weren’t aggressive enough. 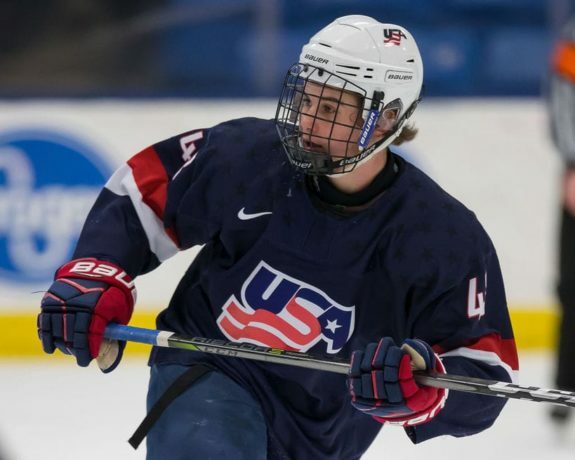 Aside from Quinn Hughes, the red, white and blue doesn’t have enough wheels to be taking chances like they did. Defensemen were spreading themselves out on the blue lines, leaving the center of the ice wide open. And if the center ice was occupied, it was only by one defender because the other was nowhere to be seen. The final goal that came from a defensive error was caused by Joey Keane not taking up the lane between two Swedish players charging down both wings. Each were covered by a USA teammate, but there was a clear lane from one side of the crease to the other that Keane didn’t fill so one short pass later, Sweden scored on an east-west play. But this isn’t a new story. Team USA has almost always struggled from this — this is just a fact of life in the realm of junior hockey. But that doesn’t mean it shouldn’t be fixed. The best route to take to fix this is to hold back on offense. If the US hadn’t been so aggressive out of the gates, they wouldn’t have gone down 2-0 in the first few minutes and had their backs against the wall. Defensemen also need to be more active. Matt Anderson was a great example of this. He intercepted passes by the opposite blue line and in the neutral zone. And back in his own zone he had an active stick; he was poking and prodding at the puck carrier and pushed them to the outside to minimize damage if they got a shot off. Another large problem was USA’s dumping tendencies. They’re not usually a dumping squad but Sweden was making clean zone entries hard, so they had to resort to dumping the puck. The problem was that the usually tactful and speedy United States was sluggish and slow to get pucks off the end boards. When they got them, they were rewarded, but often it was hard for them to scoop pucks up and send them towards the blue to their defenders. Finally, the US needs to learn how to score on the power play. Quinn Hughes, as discussed later, was a beast on the PP so they had every reason to score. Sometimes it’s not your night and that’s what it looked to be against Sweden. Both teams didn’t let up a single goal on the PP or penalty kill despite there being so many of them; it was a defensive affair. At this point, it’s just about putting it behind them, not gripping their sticks tight and moving on. The Hughes brothers are going to be dominating media coverage for the next few years and you’re going to get sick of seeing them on so many highlight reels. Think Connor McDavid coverage but more since there’s two of them (who knows how out of hand it will be when Luke Hughes joins them in the NHL). All of it will be for good reason, of course. Jack Hughes was front and center (quite literally, he centered the second line) as one of the top players in this tournament and it wound up hurting him in the later periods. But in the first period, he dazzled. There was no one out there that was faster, sneakier and more skillful than him. A play that summed up Jack in a nutshell was when he charged past the Sweden defense and executed a drop pass to winger Joel Farabee — there was a lot to dissect in that play. You can barely see the blade of his stick move when he tosses the puck to his teammate because his release is fast and subtle. His vision makes a lot of these passes possible; he sees the game differently. There were passes through and to the slot that you could never imagine going through. In the case of the Farabee pass, Swedish players were collapsing in the slot and around Farabee, who were behind Jack — there was no way the puck was getting to Farabee. But it did. My favorite part of Jack’s passing, and all over game, is how his feet and hips don’t indicate what he’s going to do. He hardly ever faces the recipient of a pass. He’s always making the goalie think he’s going to shoot. The best players do this and do it well. In the second and third periods he was less noticeable. Passes were intercepted, pucks were going in his feet and shots were being blocked. But who can blame Jack for that? Sweden had a lead of 3-1 in the second so they were locking down in their own zone. Come the third, they were just trying not to lose some times. That meant Jack Hughes had a lot on his plate, and it’s going to continue. Finland and Canada will pressure him the same and it’ll be up to him how he responds. All this pressure came as nuisance to Jack but as a blessing to older brother Quinn. Quinn had the assists on Jack’s goal in the first, as well as Jason Robertson’s goal to tie it at three in the second and Josh Norris’ goal to end it in overtime — both of the latter were replicas of each other. 3️⃣ assists for Quinn Hughes today = ??? For both of those goals, Quinn started with the puck at the offensive blue. Using his quick acceleration, he charged down the wing on Robertson’s goal and down the middle of the ice on Norris’. He snuck in past the defense, got just close enough to where he was in the goalie’s territory and sent the puck right across the crease to a teammate who netted it. And it’s no surprise he can pull this off considering the impact player he is. He can control a unit without being overbearing. He makes plays, he doesn’t dictate them. That being said, he sits perfectly atop the umbrella on Team USA’s power play. While they didn’t capitalize once, Quinn was wheeling and dealing as the tip of the umbrella. Not only did he make sure he was setting up his teammates with crisp passes, he was keeping pucks in the zone like the best of them. He was truly quarterbacking the play. Without Quinn’s presence, the United States would have come out of this game with a loss. His presence will continue to have the same impact moving forward. 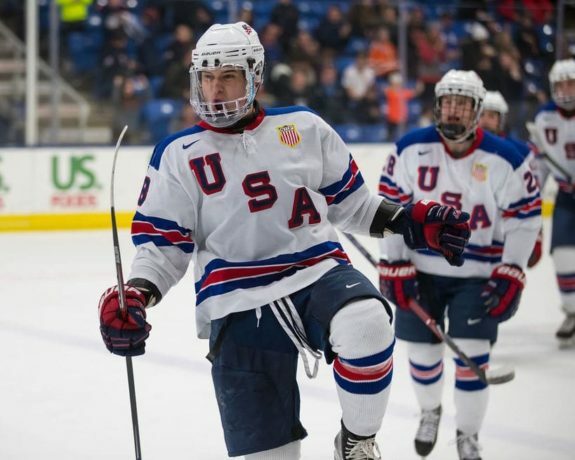 Quinn has quite the opportunity to carry this team and reach a whole new level before the World Junior Championship even comes around.